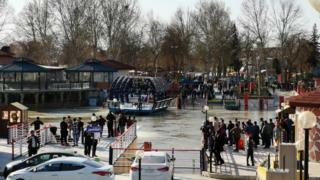 Almost 100 people are reported to have died after a ferry sank in the Tigris river in Iraq's city of Mosul. Most of the victims were women and children, the interior ministry said. It is thought nearly 200 people were on board. The ferry was heading towards a tourist island as part of new year celebrations. Mosul's civil defence agency reportedly said most on board could not swim. At least 19 children and 61 women were among the 94 people said to have died, and 55 people were rescued. The vessel was on its way to Umm Rabaen island, a tourist area about 4km (2.5 miles) upstream and north of the city centre. People across the region are celebrating Nowruz, the new year festival. Footage shows the ferry tilting sharply to the right and taking on water, before flipping over entirely and being dragged swiftly downstream by the fast-flowing river. Images on social media showed the upturned vessel and people floating in the current. "It was carrying too many passengers, so the water began to rush onboard and the ferry became heavier and overturned," one passenger told AFP news agency. "With my own eyes I saw dead children in the water." Ambulances and helicopters arrived to help survivors and search for the bodies of those who died. Authorities had reportedly warned people about rising water levels as the gates of the Mosul dam had been opened, and some are accusing the ship operator of ignoring the advice. Iraq's justice ministry reportedly ordered the arrest of nine ferry company workers, and barred the ship's owners and the owners of the tourist site from leaving Iraq. Prime Minister Adel Abdul Mahdi meanwhile has ordered an investigation "to determine responsibilities". In a statement Mr Mahdi said he was following the story "with pain and sadness", and had ordered "all state efforts" to find survivors and treat victims. The prime minister later toured a hospital and a morgue in the city, and declared three days of national mourning. Jeanine Hennis-Plasschaert, the special representative for Iraq of the United Nations secretary general, said it was a "terrible tragedy". "Our hearts go out to the families and relatives of the victims," she said in a statement. However, local information account Mosul Eye reports that security forces are trying to arrest journalists reporting on the ferry sinking. Mosul lies 400 km (250 miles) north of Iraq's capital Baghdad on the river Tigris, and is home to up to 2 million people. The city was captured by the Islamic State group in June 2014 and became its de-facto capital. It was not liberated until July 2017 after a nine-month battle that left large parts of the city in ruins.